We make and provide hair pieces and medical wigs for people suffering from a range of hair loss conditions from natural balding to hair loss due to chemotherapy. We are dedicated to producing real hair wigs and hairpieces, that feel and react like naturally growing hair, which can be individually cut to any style on the client’s head, where an experienced stylist will achieve an undetectable finish. Our bespoke wigs are personalized and incorporate a range of detailed specifications unique to each individual. 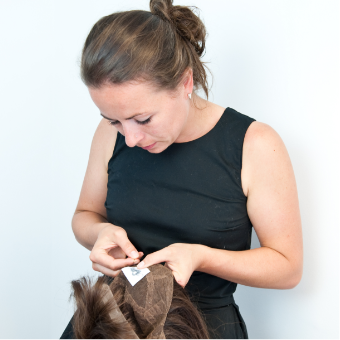 Through the fitting process we aim to replicate the individuals’ contours, as a result providing a wig that fits like a ‘second skin’ providing great comfort for the wearer. Using the lightest, breathable base materials along with hand knotted unprocessed European hair; our bespoke wigs replicate the hairs natural growth. Clients suffering from hair loss are invited to choose their hair colour from our colour chart and in-house supplies, or where possible chemotherapy patients may wish to use their own hair when creating their wig. Click on a topic below for more information about types of hairloss. We understand the emotional impact that hair loss has on both men and women. We provide a range of pieces for both men and women that are undetectable to the eye. 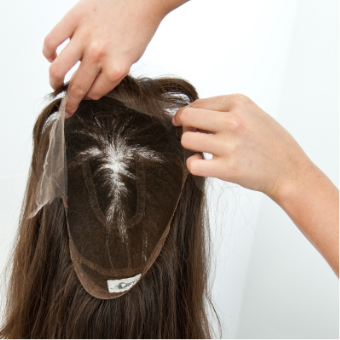 The most popular being the ‘wiglet’ for women, as it incorporates a ‘pull-through’ system, where your own hair is pulled through the piece to create a seamless blend between the piece and your own hair. For men, the ‘toupee’ is the most popular and effective. It can be made with a number of materials, depending on the thickness of your hair. We cater for a variety customers who suffer from a number of skin conditions, resulting in hair loss. The materials we use are soft on the skin; a silk lining is an option for particularly sensitive skin conditions.The hairpieces we provide are all designed after an initial consultation, tailored to each person, for an undetectable fit and finish. Alopecia is a hair-loss disease that affects men, women and children. The onset is often sudden, random and frequently recurrent. Although not damaging to physical health, alopecia can have severe effects on quality of life and emotional health through its impact on confidence and self-esteem. At Amiwigs we aim to provide wigs and hair pieces that will change lives and the confidence of our customers. Everything is bespoke and tailor-made, from the fit of the wig/hairpiece to the hair colour and texture. Customers undergoing chemotherapy treatment will be at their most vulnerable; at AmiWigs we aim to provide a comfortable, stress-free environment where customers can feel confident about the services and products we provide. All our wigs and hair pieces are made from soft, lightweight materials that are breathable and soft on the skin, which naturally becomes more sensitive and tender during treatment. Trichotillomania is an impulse control disorder where one gets the compulsive urge to pull out one’s own hair leading to noticeable hair loss and distress. It is very difficult to treat and is more common than people are aware of. 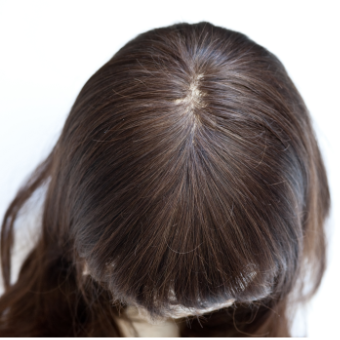 The patches that trichotillomania sufferers have on their heads as a result of the disorder vary in shape and size amongst different people. At AmiWigs we aim to provide hair pieces and wigs to rebalance hair distribution, and help with our customer’s confidence. Lupus is a name given to a collection of autoimmune diseases, in which the human immune system becomes hyperactive and attacks normal, healthy tissues. Symptoms of these diseases can affect many different body systems including hair follicles, resulting in hair loss. At Amiwigs we provide hair loss solutions for a variety of hair loss reasons, and cater for all kinds of hair loss distribution. We strive to create a bespoke hair piece/wig that will suit and provide comfort for our customers. This is a very common form of hair loss, although sufferers may feel somewhat isolated while experiencing this type of hair loss. The loss of hair that occurs is due to an underlying susceptibility of hair follicles to androgenic miniaturization. It is the most common cause of hair loss and will affect up to 70% of men and 40% of women at some point in their lifetime. Men typically present with hairline recession at the temples and vertex balding while women normally diffusely thin over the top of their scalps. Within females it very rarely results in complete baldness. 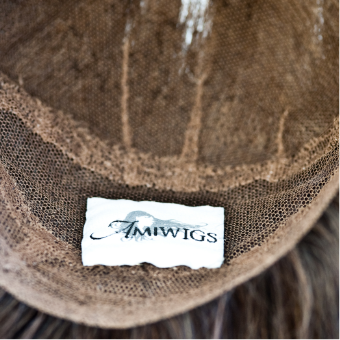 At Amiwigs we make and design bespoke hairpieces to blend in and attach comfortably to our customers’ existing hair. All our hairpieces will be colour matched seamlessly to the customers own hair and made on a lightweight base offering both comfort and confidence.